Questions of identity, oppression, the pervasiveness of audism, language deprivation, racism and resistance are just a few of the topics being explored in the art exhibition, “Justice Can’t Wait: Deaf People of Color Seeking Change Through the Arts,” and a week of corresponding events, including the annual conference “Social Justice: BY, FOR, OF People,” at California State University, Northridge. The art exhibition is on display at the CSUN Art Galleries West Gallery on the north side of campus through November 2. The full-day social justice conference is scheduled for Friday, Oct. 28, from 8:30 a.m. to 5 p.m. in the University Student Union Northridge Center. 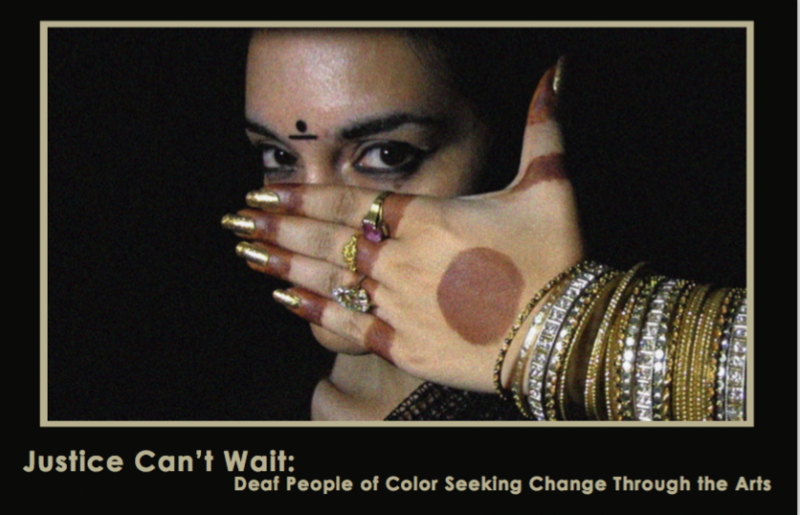 Despite the recent increased awareness about Deaf issues in popular culture with the rising fame of Deaf actor and television star Nyle DiMarco, there is still a need to highlight the intersectional experiences of Deaf people of color — who struggle with multiple, overlapping forms of oppression and discrimination, said Lissa Stapleton, assistant professor of Deaf studies at California State University, Northridge and co-curator of the exhibition. Stapleton said the exhibition and programming creates a supportive space for Deaf artists of color to share their thoughts and perspectives on myriad social justice issues. The artists’ work illuminates their intersectionality, their journey, their talent, and their experiences as Deaf people of color who are often overlooked by the community at large, said Stapleton. The exhibition features 20 works of art by 10 Deaf artists from the United States and Australia. The artists explore a variety of social justice issues through paintings, cartoon drawings, mosaics, dance, American Sign Language (ASL) poetry, video and more. Among the artists are cartoonist Shawn Richardson, whose work has been featured at the Dyer Arts Center in Rochester, N.Y., and Sabina England, named “Emerging Artist of the Year 2016” by the St. Louis Visionary Awards. CSUN art professor Mario Ontiveros, co-curator of the exhibition, said the small space of the West Gallery will hold a multitude of artistic expression. On Saturday, Oct. 29, the exhibition also will showcase the work of young student artists from Marlton School, the Los Angeles Unified School District’s public school for children who are deaf or hard of hearing. Wednesday, Oct. 26 – Afro-Cuban Dance through ASL with Antoine Hunter. 5:30 to 7:30 p.m. in Redwood Hall room 292. Friday, Oct. 28 – Social Justice: BY, FOR, OF People conference. From 8 a.m. to 5 p.m. at the USU Northridge Center. Tuesday, Nov. 1 – Viewing of film, “Deaf Jam,” which highlights a young, Deaf, Israeli-born teenager coming to understand and connect with her Deaf identity through art and poetry. From 6-8 p.m. at the Valley Performing Arts Center Kurland Lecture Hall (LA 100). The exhibition and corresponding events are a collaborative effort of the CSUN Department of Deaf Studies; Michael D. Eisner College of Education; Mike Curb College of Arts, Media, and Communication; College of Social and Behavioral Sciences; CSUN Art Galleries; Deaf Education And Families Project; CSUN Office of the Provost; CSUN Deaf Studies Association; the National Center on Deafness; Sorenson Communications and Marlton School. All events are free and will be interpreted in American Sign Language. Guests requiring close-vision or tactile-interpreting can contact Christine Mitchell at christine.mitchell@csun.edu.